The M2-F1, a wingless landing body, is towed behind a C-47. 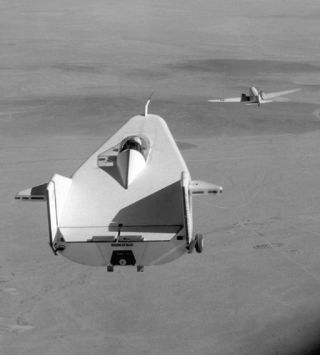 In this historic photo from the U.S. space agency, the M2-F1 lifting body is seen being towed behind a C-47 at the Flight Research Center (later redesignated the Dryden Flight Research Center), Edwards, California in 1964. The wingless, lifting body aircraft design was initially conceived as a means of landing an aircraft horizontally after atmospheric re-entry. The absence of wings would make the extreme heat of re-entry less damaging to the vehicle.